In 1944, a tragedy struck the Chagall. Chagall's wife - Bella Chagall died of a viral infection. The couple had loved each other strongly from the moment they first met, and had lived happily together as husband and wife for 29 years. For Chagall, this was a heavy blow. More than just the object of his affection, Bella had been his muse and his kindred soul, with the same ironic, light-hearted approach to life, which can be read easily from the texts of her works (Bella was a writer, though she was never published during her lifetime). For the first time since childhood, Chagall set aside his brush and easel. He would be unable to paint for many long months, almost an entire year. In 1946, Chagall ventured back into Europe, where his career had begun. Over there the painter met Virginia Haggard McNeill, with whom he had an affair. This revived his desire to paint and imbued his brush with a fresh vivacity, visible in his work Cow with Parasol. This poetic picture is a wonderful illustration of Chagall's fertile fantasy and mastery of colouristic techniques. The subject is absurd - a cow walking over the roofs of the village, holding a parasol and steeping with one roof on the village clown. The warmth of the sun is conveyed in a glowing orange tone. 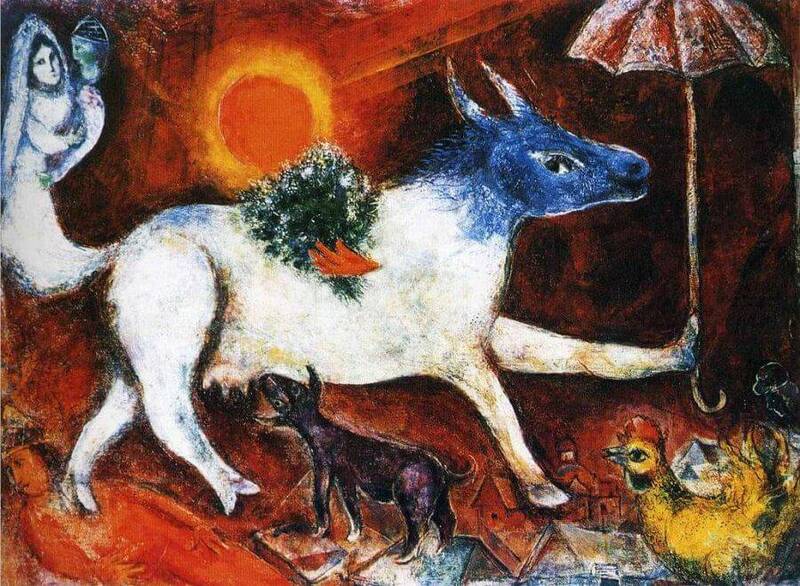 The artist has adopted the classic stylistic device of substitution, replacing man with an animal: it is a device that is characteristic of Chagall's art, and is used in exemplary fashion in this painting, where it contributes a great deal to the anecdotal charm that is at the core of the picture's irony. Nonetheless, sombre colours still dominate the painting, and its humoresque qualities seem to be a compulsive insistence on cheerfulness. But perhaps my art is the art of a lunatic,...mere glittering quicksilver, a blue soul breaking in upon my picture"